Your generous donation to the American Print Alliance helps support the many programs offered FREE to you and the public. There are traveling exhibitions and the Memorial Portfolio, and tons of information available on this website, a bibliography and list of Print Study Rooms, etc. In fact, all the information is free to everyone except for some publications and professional information, like the Guide to Workshops and List of Competitive Exhibitions, for which we ask you to subscribe to the journal, Contemporary Impressions. The American Print Alliance is a 501(c)(3) non-profit organization. Your donations are tax-deductible in the U.S. to the full extent allowed by law. Send a check or take advantage of this secure PayPal button to make your donation by credit card. Be sure to contribute by midnight on December 31, so you can take the deduction on your taxes for this year. If you would like a separate receipt, please send an email to director -at- printalliance . org after completing your PayPal transaction (be sure to type the @ symbol and delete the spaces in our address, we're trying to protect the mailbox). Michael Marling de Cuellar, Southern Company, 2006. Gum arabic transfer, 10 x 8". Stephanie Smith, Nature, 2003. Woodcut and linocut, 7.25 x 10". Both prints are in the current traveling exhibition Soap Box Prints: For a Cleaner Environment. promotes the print, the essential art of the 21st century. 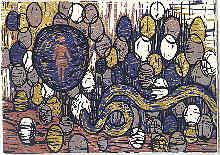 The American Print Alliance is a consortium of non-profit printmakers' councils in the United States and Canada. The Alliance sponsors national and international projects, like this website and traveling exhibitions. Alliance funding comes primarily from subscriptions to our journal, Contemporary Impressions. Read it to catch up on the critical issues surrounding contemporary print arts, take part in the dialogue and inspire your creativity. By supporting the Alliance with your subscription, you also get an advocacy organization, exhibitions, resource publications, and more. Make a commitment to help us bring the print arts to their fullest potential! Our Guide to Workshops is now an online resource, easy to search and free for subscribers to our journal, Contemporary Impressions. As a resource for the print arts community, the Guide lists workshops open to artists besides the owner where you can take a class, rent time to work independently, apply to be published, contract to have plates printed, etc. Colleges and universities are included if they bring in visiting artists or offer access / classes outside a regular degree program (often in community or continuing education programs). Information includes techniques and press sizes, paper and book arts, photo and computer facilities, galleries, classes, handicapped accessibility, and much more. About 575 workshops are listed so far. This year we'll be celebrating the printmaking entrepeneur! Please join us. Events begin Friday evening with print animations organized by Jerstin Crosby. On Saturday we'll take part in "merch" printing for the music show produced by Kyle Bravo, add pages to a collaborative zine project, and join the community in creating a field of pinwheels for a new PrintSpin installation. There will be panel discussions and exhibits, too, all free! Go to the special website for more information, www.pdd-diy.org. See the posters (PDF) for our 2011 Print Dialogue Day at North Georgia College & State University and our 2010 Dialogue Day at Kennesaw State University. Print Dialogue Day in 2013 will be in the Spring with the theme Printing : Green. 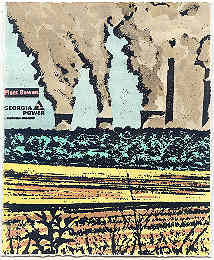 On April 20, 2013 at Columbus State University in Georgia we'll be addressing environmental issues in studio practice as well as the Earth Day "big picture" of prints in advocacy for our planet. PrintSpin is a print and paper project that takes a light-hearted look at wind energy, engaging the public by showcasing printmaking techniques and three-dimensional design. The Alliance challenges printmakers, especially students, to get involved as advocates for clean energy and for printmaking. Carol Pulin, director of the American Print Alliance, is available for workshops. Our current traveling exhibition shows how prints express the rights and responsibilities of democracy and inspire people to defend freedoms, serve in elected office, vote, demonstrate and take part in political life. The exhibition itself demonstrates that prints can be an influential part of the democratic process. The exhibit is traveling: please help us find additional venues, so we can demonstrate to the world how printmakers advocate for democracy. In honor of Ken Kerslake, who of all his many awards was proudest of his recognitions for teaching excellence, our board of directors has established The Kenneth Kerslake Memorial Fund for Student Subscriptions to Contemporary Impressions, the journal of the American Print Alliance. Soap Box Prints: For a Cleaner Environment. This portfolio of 120 prints, paperworks and artists' books is available to travel to venues throughout North America. The first opening was at our Print Dialogue Day 2007 at Appalachian State University in Boone, North Carolina. Schedule the exhibition at your school or environmental organization! Subscribe to Contemporary Impressions, the internationally acclaimed journal that brings you critical and enlightening articles, interviews, exhibition listings and book reviews. Individual subscribers receive full access to our site. Subscribers, be sure to look at the Competitive Exhibits listing we've just updated for more opportunities to show your work! Please thank the suppliers and manufacturers who support the American Print Alliance with grants and with their advertising. Here's a sample from the Supplies page in our Resources section: click here for more. Freelancers Union is a nonprofit membership organization that represents the needs of independent workers through advocacy, information and service. Members have access to group-rate insurance plans, educational seminars and networking events, and participation in advocacy campaigns. Visit www.freelancersunion.org and join for free.